INTRODUCING A HI-TECH SOLUTION FOR CONVENIENT AND SIMPLE VISION TESTING! 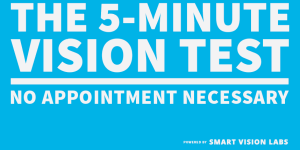 Get a prescription for glasses or renewal contact lenses in about five minutes! Call and ask us about it today (718) 297-2997. Based on the same wavefront technology used in many NASA-partnered telescopes, Smart Vision Labs’ 5-Minute Vision Test lets you get a new or updated prescription that’s every bit as accurate as the old school eye testing equipment (which hasn’t changed since the 1900s).